surf2create: An AHA moment! Spools used for craft room lamp! Putting the lamp together with the hardware was easier than I thought it would be. Hardware for lamp used in my craft room. I had to find a lamp shade. This is when I started searching on Pinterest again. I found a lamp form to cover at Hobby Lobby. I had never covered a lamp shade. I found a video on youtube.com that showed me how to make a pattern. And, I also pinned many pins about this process as well. Once I covered the lamp shade with my accent fabric, I came up with my on accent idea for the rest of it. I found large buttons at Hobby Lobby and covered them with my main fabric pattern. I used Mod Podge to cover the fabric so to glue them to the buttons but to also give it a little shine. I used my twine theme and ran the twine through the buttons. 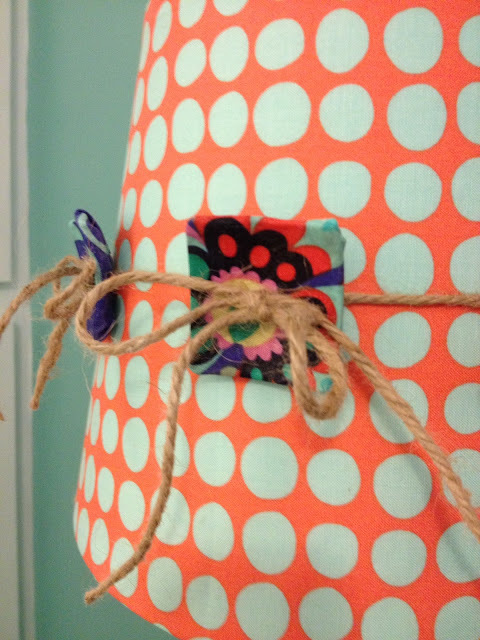 I used a seam ripper to make the holes in the fabric for the twine to run through the button holes. I made a 'head wrap' for the lamp shade. I just slipped it over the lamp shade. I LOVE my lamp and have received so many compliments! I love the way it brings so many things together in my craft room, that I feel it is a main focal point in my craft room. And, as you see, I use pictures of it for many of my favicons and icons on my blog, facebook page and twitter feed. Lamp design for craft room. My focus point in my craft room. Happy surfing, pinning and creating!